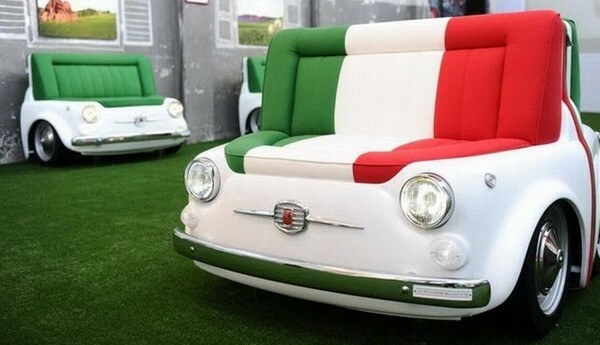 Here's some awesome furniture inspired by the Fiat 500. The Fiat 500 Design Collection was recently showcased at the Milan International Furniture Fair. The collection includes a table (Picnic), console (Cheers), and a sofa (Panorama) designed by company Meritalia and Fiat chairman’s brother Lapo Elkann. The “PICNIC” table features the frontal parts of the 70 FIAT 500. The side wheels are made of flexible polyurethane elastomer finish in matte black. ”Cheers” console has a basic structure in sheet form that reproduces the front of the FIAT 500.The top is tempered glass extra bound to the base with polished aluminum supports. Available in three heights. The sofa “Panorama” has a steel perimeter frame that approximates the shape of the front car FIAT. The padded seat and backrest made of polyurethane with different densities, make it particularly comfortable. The covers, in fabric or leather, with stitching and geometric pattern side wheels are made of polyurethane and add stylish details.